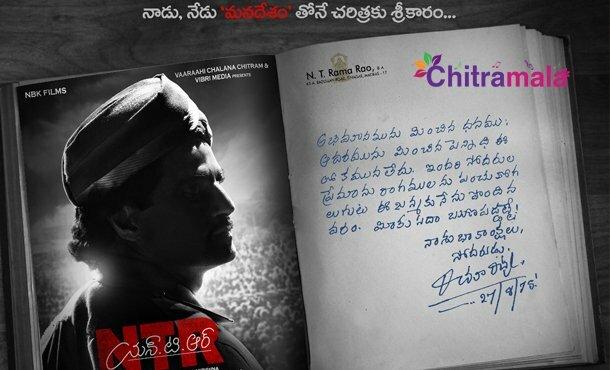 The great biopic of the legendary actor NTR starts today. The movie regular shooting started today in Saradhi studios. It is a very auspicious day as the legend started shooting for Manadesam on this very day in 1949. Here is the official first look of NBK from the flick. NTR Biopic movie is being directed by Krish and MM Keeravani is composing music. This movie is NBK’s 103 movie and the latest buzz is that NBK son Mokshagna will be seen in a special role in this flick. Initially, the movie launched by Teja but later he walked out from the project. Now Krish handover this movie. Nandamuri fans are eagerly waiting for this flick because Krish and NBK worked for a blockbuster movie Gautami Putra Sathakarni in the past.